Oklahomans deserve another tax cut, no matter what. Most state agencies can absorb a 5 percent budget reduction without suffering. 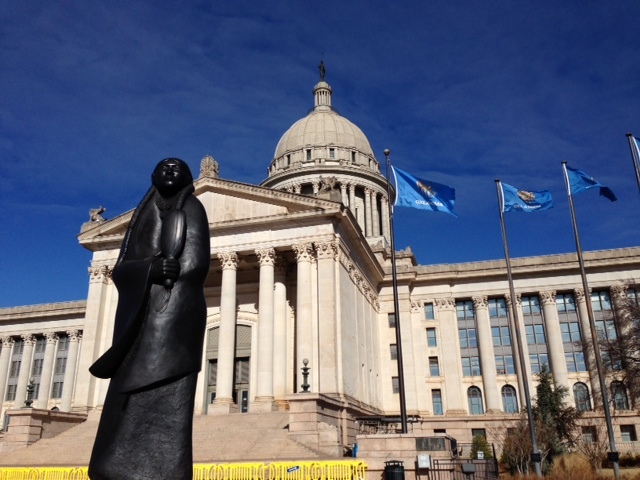 Just about anything the Obama administration is for, Oklahoma’s executive branch is against. Fallin’s State of the State address, her fourth since taking office, set the stage for the beginning of the 2014 legislative session, which began Monday and will end in late May. Besides calling for another income tax cut and reduced funding for most state programs, Fallin denounced Obamacare, defended state education reforms, denied pay raises to most rank-and-file state workers, asked school districts to take care of their own storm shelter needs and endorsed debt financing for Capitol repairs. “Let’s take this opportunity to show our country that lower taxes and limited government do work,” Fallin said as she wrapped up her 42-minute address and aired what may become the central theme of her 2014 reelection campaign. Oklahoma Watch’s Warren Vieth covered the governor’s speech and the immediate aftermath in a series of live-action tweets on Monday. Follow us on Twitter to read more @OklahomaWatch. You also can view the governor’s detailed handout on her budget proposal. Click here to see Gov. Mary Fallin’s State of the State speech in a word cloud and full text.